Sustainable protein is a vital part of a healthy diet. In South Asia, there is a significant shortage of fish in the communities we serve. Due to overfishing in nearby water sources and the high cost of protein, many families do not have sufficient protein as a part of their diet. Our innovative fish farm is meeting this critical need. GFM has developed cutting-edge aquaculture technology to make nutritious, organic fish affordable and accessible for poor, malnourished children and families to rural communities. Each fish tank can produce 9,000 pounds of fish per year while using only 10% of the water needed in traditional pond fishing. 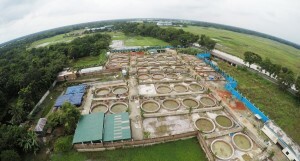 Within the first year, each tank becomes self-sustaining as the fish are sold, continuing to provide jobs. This project creates a nutritious and sustainable food source without any further investment needed. Our Fish Farm includes 60 fish tanks and will provide 245 tons (490,000 lbs) of sustainable, organic fish each year. Join us in transforming rural communities in South Asia through this innovative and self-sustaining project!